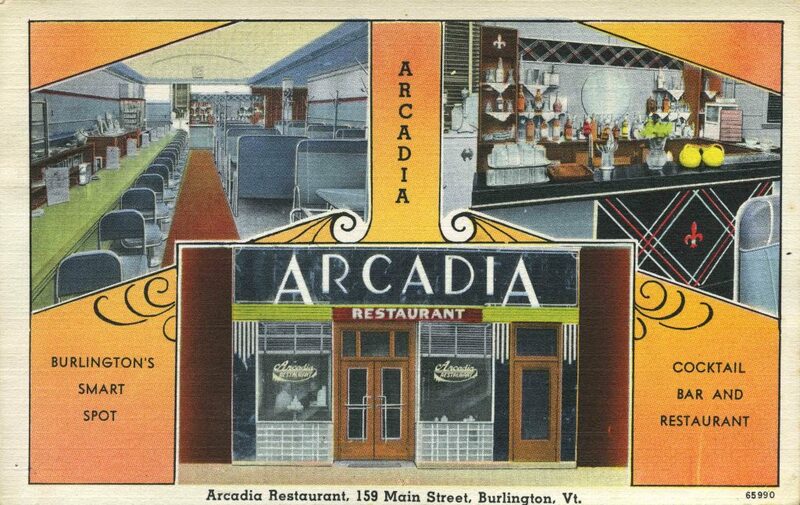 Arcadia Restaurant, 159 Main Street, Burlington, Vt., Tichnor Brothers, c. 1930, Llewellyn Collection of Vermont History (2010.1.1232). From cafes to cafeterias, doughnut shops to diners, bistros to bars, the City of Burlington was peppered with eateries by the late nineteenth century. Then as now, residents and tourists could choose from a wide variety of dining establishments tailored to diverse tastes and budgets. Dining Out in the Queen City, a new exhibition in Champlain College’s Roger H. Perry Hall features vintage menus, matchbook covers, and other promotional items from Champlain College’s Special Collections documenting Burlington restaurants from the nineteenth and twentieth centuries. Van Ness and American Hotels, Menu Card (back), August 5, 1891, Local History Collection, 2016.2.1. The New Sherwood Hotel, located on the corner of Church and Cherry Streets from 1893 to c. 1940, offered dinner and dancing at its Royale Grill. 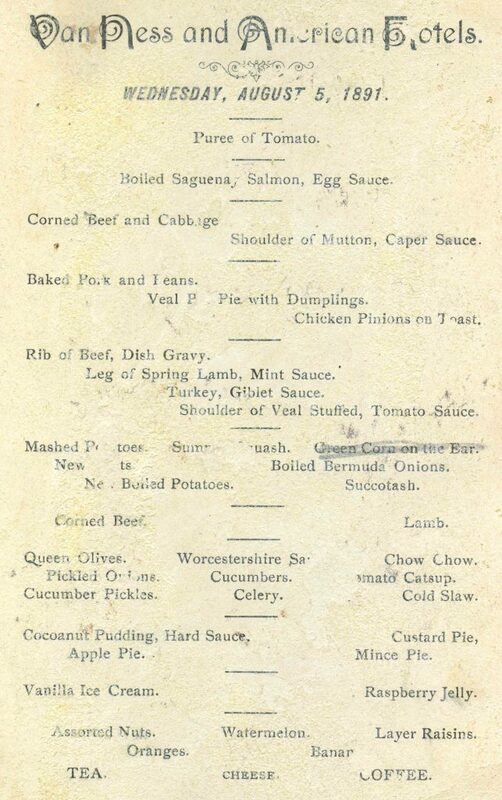 A Royale menu from about 1910 features several prix fixe meal choices along with many additional a la carte options. 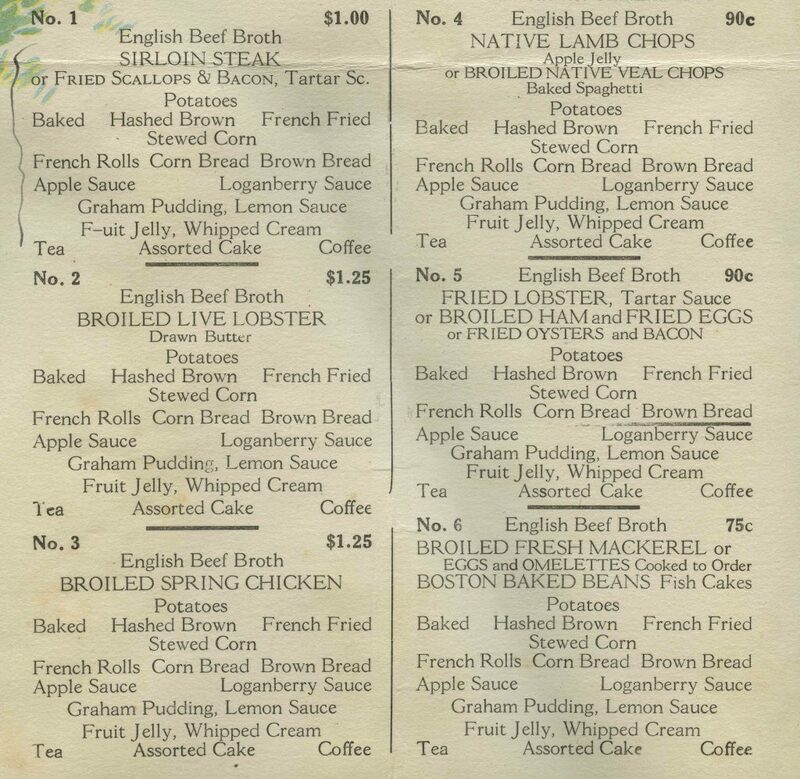 This eatery was one of several restaurants in land-locked Burlington to offer lobster, oysters, scallops, and other seafood, presumably imported from the New England coast. Check out the prices! Detail, New Sherwood Hotel Sunday Supper Specials, c. 1910, Local History Collection, 2017.47.1. Dining Out in the Queen City also features several matchbook covers for eateries about which little is otherwise known, providing tantalizing windows into dining out in the Queen City in decades past. At a time when cigarette and cigar smoking was omnipresent in American life, promotional matchbooks were a surefire advertising method. Now they function as crucial documentation for vanished Burlington restaurants, like this one for the Star Restaurant serving Chinese and American food in the 1930s. Star Restaurant Matchbook Cover, Local History Collection, 2017.55.1. This exhibition just scratches the surface of our holdings related to area dining establishments. Are you interested in local fixtures like Valade’s Terminal Restaurant & Cafeteria, the Mayflower Hot Sandwich Shop, Frank Bernadini’s Cafe, the Oasis Diner, the Chopping Block Coffee Shop, the Olde Board, or the Harbor Hide-A-Way? Check out our online catalog, or make a research appointment to visit us in person.